V2131. HAROLD WAYNE, Vol. XII, incl. Desider Arányi, Julius Bochnicek, Stanislaw Boguchi, Rosalia Chalia, Adamo Didur, Alexandr Davydov, Maria Emskaya, David Juzhin, Janina Korolewicz-Waydowa, Andrej Labinsky, Jean Martapoura, Cathérine Mastio, Gavriil Morskoj, Nikolaj Seversky, Max, Tartakov, Bragina & Czosnowska. 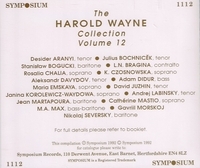 (England) Symposium 1112, recorded 1901-04, 'Seven Inch Recordings, incl. 28 Berliners'. Final Sealed Copy!